I used to coupon and get lots of food for next to nothing. It took some time, but boy did I get some great deals. One problem: a lot of the food was processed and not fresh. It would sit in my pantry until I donated it to college kids who will eat anything or the food bank. If you eat Hamburger Helper, Fruit snacks, Potato Chips, Soda or other processed foods, think about changing your eating habits. 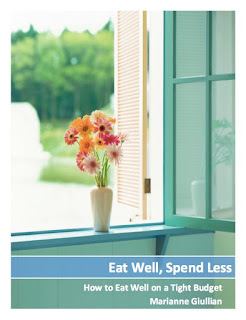 I am still spending as much as I did before, but we eat less and eat healthier. It takes less time to prepare the grocery list and go shopping. So, where are the savings? They are long term. You may not see them right now, but you will feel better. The Western Diet, so to speak, with all of it's processed foods is not a healthy diet. We wouldn't have so many people with health problems if people switched and ate less processed foods. Eating well is like putting money in the bank for retirement when you are young. I wish I had understood this years ago. It may have saved me from some of the health challenges I have had to face in my life. I have always cooked a lot of things from scratch, but I could have done much better. When something good happens, it is easy to go celebrate by going out for ice cream or other food full of fat. It is also hard to change eating habits, so be patient if you choose to change. So true - great advice, including (and maybe especially) the last sentence. Erika, Keep up the good work cooking from scratch. I have found that it is the recipe that makes a difference for me whether it works or not. Find good recipes and you have good food. It will come; just don't give up. I couldn't make bread when we were first married, but now I can do it really easily. Thanks for the Blog award. That was very kind of you! We will link back and pass on the kindness.